Google Spreadsheets has recently added an interesting feature: keyboard accelerators for menus, but it only works in Chrome. You can now press Alt+F (or Ctrl-Option-F for Mac) to open the File menu. Then type one of the underlined characters to select an option. It's now much easier to use features that don't have keyboard shortcuts, just like in a native application. Chrome is the only important desktop browser born without menus and that's probably the reason why web apps can override shortcuts like Alt+F. It's important to point out that you can use shortcuts like Alt+F and Alt+E to open Chrome's wrench, but not in Google Spreadsheets. 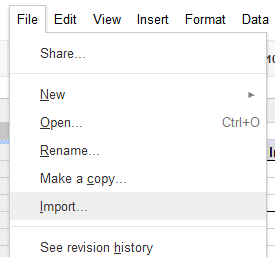 While Chrome's interface was so great that many other browsers used it as an inspiration, Google Docs continues to use the old-school menus from Microsoft Office 2000.